Disclaimer - any brands appearing in the images are only illustrative and not guaranteed to find their way into any future SCS Software project. It's just an experiment. 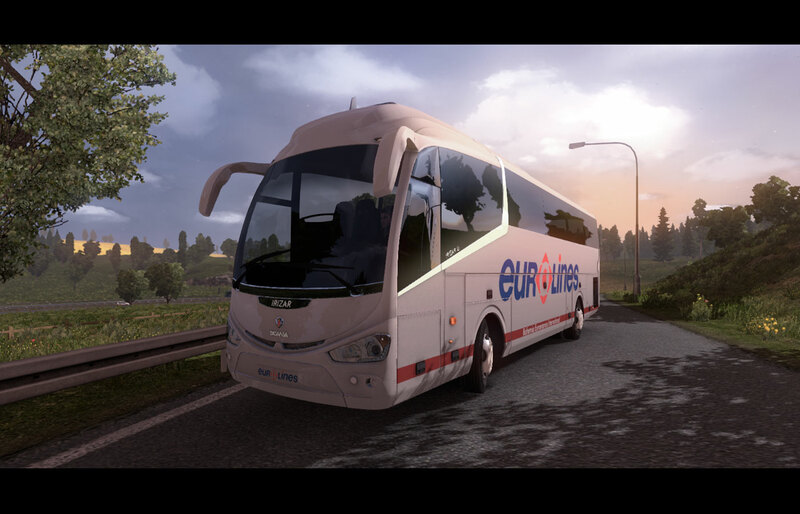 Though if you happen to be an owner of a major coach bus operator in Europe, we'd love to hear from you and discuss how to make it possible to feature your brand in our game(s) ;-). Touring Europabus Romania owns the brand, Eurolines, and represents TUI brand in Romania. Eurolines Organisation is an International Non-Profit Organisation according the Belgian law. The registered office is Metrologielaan 6, 1130 Brussels. They should use the time spent in bitrens for the game. This game is not a simulator bus. everywhere is something made​​. and then nothing is perfect out there. SCS make some fantastic games which are of great quality. There are some other labels out there that continually release a poor simulator with poor graphics and poor gameplay. SCS are much better than this by far. Buying their games helps to fund development of add-ons for ETS2 as well as new games such as this new simulator. I'm a game programmer and I'm sure that SCS always make incredible games. They are very talented. Don't like SCS's games? Fine. Just because SCS doesn't give 200 free updates for its game doesn't mean that the game is unfinished. No company will ever keep giving free updates. If they keep giving a bunch free content there will be no point for an ets 3. i know the type of person you are, you just want to pay once and get a never ending game, well, that's never gonna happen. So we are driving ETS2 map in coach ? I'd really like to drive a coach with 3 axels and double decker. I hope they add disney land to the ETS map for ECS, haha! You know it's in fact good idea? Such other points of interest than bus terminal in the city. Some theme parks, castles, historical towns, nature reserves, mountain cottages, seaside resorts... just what about European tourism is. That would be cool. Really hoping for working doors, and dashboard buttons. A bit like OMSI but with SCS flair. That is exactly what i'm expecting! I would also like to see some passenger view. I really appreciated coach interiors. SCS should first make ETS2 properly. much blah, blah, blah and nothing behind it. what is not done in ETS2? I must admit, the model of the i6 Irizar doesn't look that good. Newest trucks you've created seem to be in a different (higher) league, compared to this bus. Room for improvment I think SCS, but you are moving in the right direction! Hopefully, it's just half way done model! This is just an alpha representation of the model, of course there's a lot to improve. We waiting for game . There will be a expansion of the map or an upgrade? SCS please add tiny models of buses. and with increasing experience can lead to something big . Glad to see that you're expanding your options beyond trucking. Well done, SCS. Try making the Scania OmniExpress. That'll give you something to do for a while. Hey, it's a map like ETS 2! I LOOOOOOOOVVVVVVE you SCS !!!!!!!!!! Great job SCS can't wait to see more, hope the licensing talks go well..
greats news!!! i love scs! Looking good. Any release date? The best transport company in Poland "Polski Bus". They have very little money and run only and Van Hool Altano and Astromega.Probably agree on the licenses for this company recently created and want to advertise! Scs are doing a great job! We look forward to the interior of the coach and the best coach in the world Neoplan Starliner. Will new game (and all new games of SCS Software in future) be released with Linux port immediately or we should wait several months before Linux port appear? See this post on TheSimulatorDriver.com! Come on, the bus mods for ETS 2 are so horrible. There's a lot of people who want to drive a coach, not just truckers. NEXT ETS2 NEWS ARE COMING!!! PS: THIS SCREENS ARE GREAT,TOO! Nice news but can't we hear some ETS 2 news for a change. This is the game we're all playing now and want to know what plans you have. Please, don't make it a game, instead, make it an expansion for ETS 2. I will gladly buy it. Speak for yourself! Some of us prefer buses over trucks and it'll finally be OUR turn to get a dedicated bus sim!!!!! @Anonymous, YOU have to speak for yourself, idiot. Anonymous, you contradicted yourself. That's why he called you an idiot. I spoke for myself and then you come pestering. Get lost! Great news and great pics. Thanks SCS! i love all the version of SCS. and eurotruck 2 is awesome edition of the SCS game history. here if you like my suggestion. so add some bus terminals and make this for the bus mods as well of european companies. 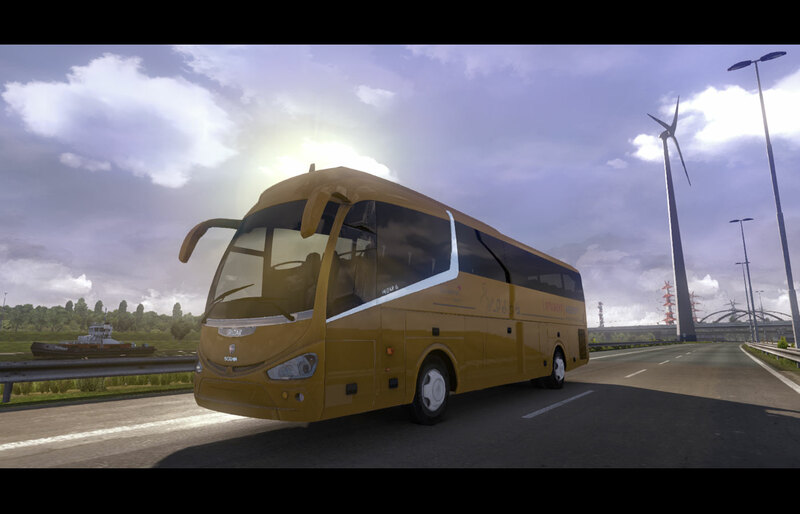 because mejority of people love to drive the buses around in the game locations and that is really great for adding IRIZAR I6 model in the game. so i hope that future games will be including this features. The screenshots make Coach Simulator look crap, low poly! are you playing the game on lowest settings? If this game can get Bus lanes it's just an perfect game. I hope you will release it. Whenever. Also if it was legal to open up the front door and behind .. 'd be grateful! Also wanted to add of Irizar buses PB6x1 .. would be nice to grateful! This kind of posts we want to see. Thanks. We want Mercedes-Benz and Neoplan. I hope for you, and a little bit for myself too hihi. Please add Icelandic Excursions that would be so awesome! You should really make an scandinavian DLC. WOULD BE AWEZOME! I wish you luck in achieving bus simulation. SCS Software lords, I give a suggestion about coaches, in Spain there are two major coachbuilders of the Irizar exporting to Europe and countries of the world. The bodybuilders are Sunsundegui and Beulas. I leave the links on their web pages just in need. Besides, I also gutaria that was unveiled coach small businesses, if they want some not hesitate to contact me. I hope you learn my suggestion. Omg! This is so cool! I love Bus Simulators and this one really looks awesome! I can't wait! here I leave the links unpublished bodybuilders in my previous post. Wow, I did not expected you think not only about real vehicle brands, but also about real coach companies... well then, Student Agency is a MUST! True example for every entrepreneur. I really hope you'll get in touch with them and they will be interested in co-operation. And buses looks just awesome, as well as that Peterbilt in previous post. Splendid work, hats off. SCS, I see great things ahead of you in the future. ETS2 was and still is a great game, these next projects will be even greater. Please, though, make a new patch for ETS2, because the last one was crappy and felt like it was rushed. Please, take your time with those patches in the future, because I don't want you to become one of those companies who just rushes everything. Anyway, so these busses look great, glad to see you are doing more than just truck games. And the fact that you are doing an American simulator is just amazing since I am an American living in America myself. Keep it up guys, great future ahead of you. Try to get as many real brands as possible, and try to do some advertising in the U.S. because, with the right techniques, these games could really take off! If you make a simulator with bus just like you did with et2 it will be great. I love you guys!" Frankly folks, I have mixed feelings when seeing these pics. On the one hand, this Irizar model is bloody awesome! But on the other hand, the pictures suggest that ECS is using the same basic ETS2 map, which takes away the element of surprise (and the joy of map exploration). You definitely need to include new gameplay elements in ECS if you want me to buy this game, because selling the same ETS2 content (with the only difference of driving coaches instead of trucks) with the same pricetag is a no-go for me. Right now, I'm much more interested in your American truck sim - there, both the vehicles and the environment would be completely new. 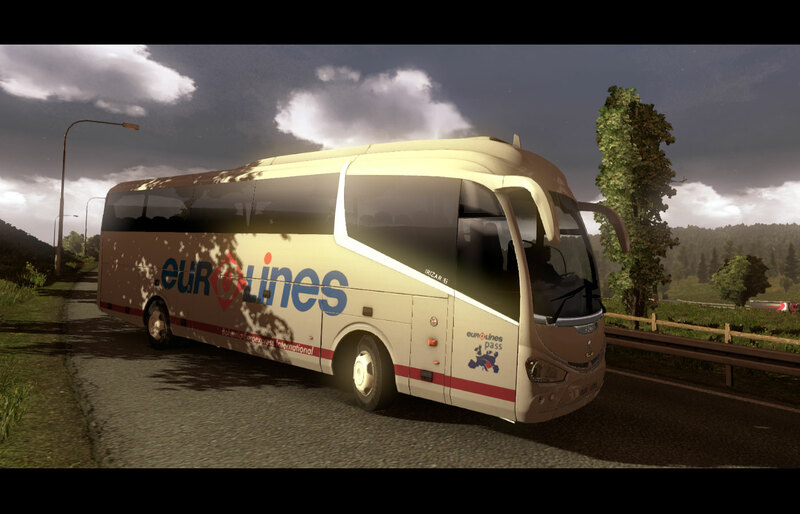 if you go down the bus route it would be nice if we could add our own logo to the buses rather then having to work for another company and expand our own company just like it ETS2. Just one word : Thanks !!!!! from a french Coach lover. Looks mighty fine! Hope the driving happens more around cities and less highways. Would make a change of pace from ETS2. Then again, highway buses are also very interesting. I definitely buy this game!!! !PLEASE TELL YEAR OF RELEASE? Hello from a follower in India! On the note of ETS2, it has been such a great game and with the recent updates i'm loving it like never before. Its a complete de-stresser after a day of hard work. Just sit back, grab a cuppa, and drive into the sunset or fight a doomy rainy day (kept the rain meter to full :D). Although it'd have been awesome if you guys introduced a few realistic features like wear-n-tear for the tires and the weathered look (truck gettin dirtier and dustier as the kilometres increased), possibly a clean wash station at gas stations, in your next patch. I dunno if thats a license issue but would have been great. I just wanted to add my comment as well as I LOVE the idea and been dying for a good bus game. Wow. Držím palce, nech sa vám to podarí. Je to skvelý nápad EuroCoachSimulator. Tiež by som bol rád, keby ste dali aj nejaké informácie o pripravovaných nových mapách do ETS 2, že kedy to vynde a hlavne cena, prípadne aj niečo o novom patchi. K tejto téme: tiež by som navhrhoval Karosy ako napr. Karosa 700, LC 930, Mercedes Travego ročník 2008, Irisbus Magelys alebo Evadys. K ETS 2: kedže robíte nové modely, mohli by ste aj Scaniu upraviť, teda že dáte aj spoilery nielen na Topline ale aj Highline. Fakt svkelá práca SCS. Kupíl som si orginál ETS2 a už pomalí šetrím na EuroCoachSimulator, ale aj na DLC packy do ETS 2. Would be great to have a couple of good old coaches from 1990's, like Volvo B10M, Volvo B12 or Neoplan Cityliner. When I was a student, I spent a lot of time in these busses. I've been always wanted to drive them :). Also I would like to see the SETRA brand represented. Are you also thinking about double-deckers? SCS Software, please tell us if the Iveco STRALIS Hi-Way for ETS2 is finished, i'm interested. I will recomand to do as they do in Omsi Bus SSimulator. make the bus cool, with cool stuff to do with the buss. The new Scania Streamline in action ! Hi,great design, hopefully soon acting the game. SCS please VERY importantly add LED destination displays. Also when you're getting the licenses why not specify inclusion in ETS2 as AI? A Coach or Bus driving game with as much level of detail as ETS 2 would be fantastic for me. I drive busses for a living. And have even worked on coaches. I will be watching the development of this very closely. no lo puedo creer!, hay muchos busologos (me incluyo) que utiliza como base los juegos de SCS Software, para modificarlos y hambientarlo con buses, y es un arduo trabajo el que se tiene que hacer, entonces para nosotros, tan solo esas pocas imagenes nos deja en shock, seria una proyecto soñado y mas con ETS2, feliz con las fotos ojala se pueda concretar. Now to hope SCS is gonna tackle a car simulator. why not connect ets2 and bus mod or other similar sim games even more. 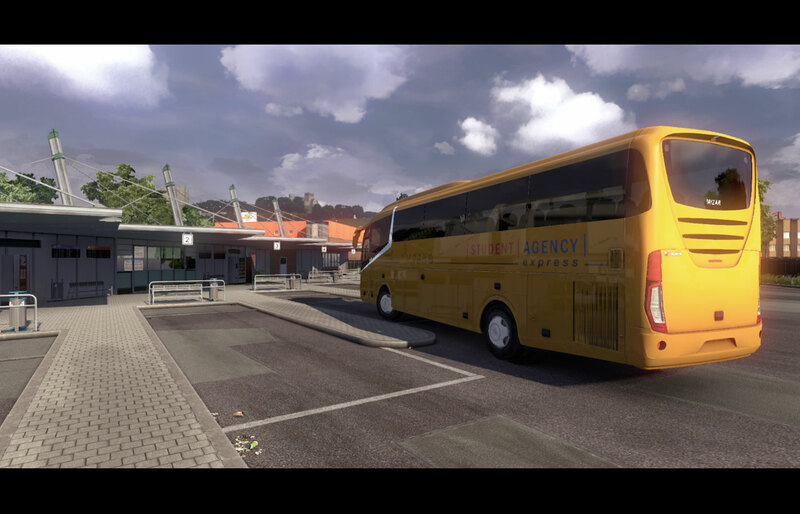 Maybe can be in ETS2 game bus stops and bus sometimes stops and take passenger. I know you're focused on coach buses, but please consider making a simulator with bus stops too (like in a city) instead of just a start and stop point. There aren't very good simulators out there, and the only decent one (OMSI) is very unoptimized. Seeing a bus simulator of SCS quality would be amazing. Please keep it up guys. the very time we need a game of this. hands to work scs count with you. I would like when you finalised next upload ? you inform us that you work on many topic its goods news. there are a great expectation for ETS 2. I hope you considered remarks from your user . I must say I have one condition though: no compressed time and 20 minutes day/night cycle. That will be a deal breaker for me. Better focus on a smaller map with real distances, IMO. Will the game be like ets 2 where we buy coaches and manage company as well? Oh my god , you are the one SCS ! can't wait for this simulator!